The new AQUA-SEP: Series 3 reverse osmosis fresh water maker is a true workhorse. It is capable of delivering between 25 m3/day up to 100 m3/day of potable water daily under the most challenging conditions. The system is pre-engineered over the production capacity range and pre-programmed for any of the optional items. A highly suitable model of choice for ship owners with a varying fleet of vessels. Due to the high manufacturing standardization, operating the system, maintenance activities and performance provide familiarity across the fleet. With the installation of reverse osmosis systems it is important to verify details on operating condition, available space, interfaces and installation. Marship Engineering assists you in critical interfaces and checks for the operating conditions of your asset. 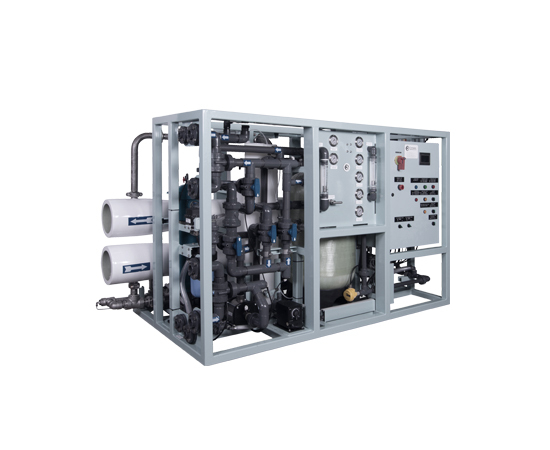 These include: SWRO membrane projections, required feed water conditioning and pre-filtration, electrical – and piping interfaces, suction arrangement, storage tank delivery head and chemical injection pre- and post treatment systems. Special attention for permeate water conditioning is necessary in case of retrofit. Have a look at AQUA-SEP: Series 3, for more specific information.